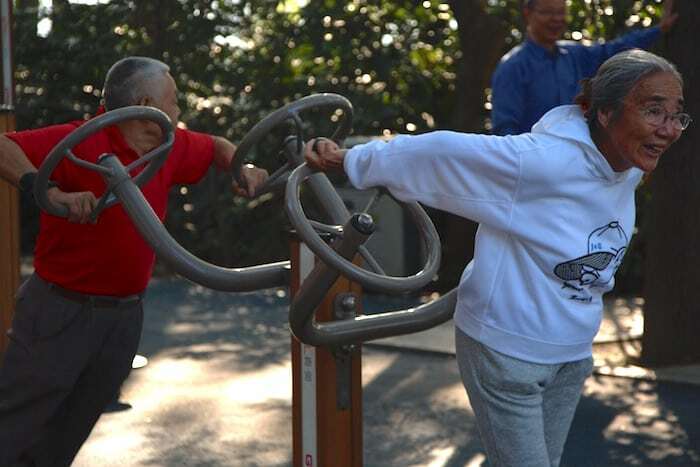 Why just walk when you can include some arm exercise or an ear massage to stimulate I don’t know what energy point so that your qi can benefit. Otherwise, clap your hands: for shoulders, chest, legs, back, trapezoids, biceps, triceps and even the sternocleidomastoid! Or even let loose a really loud yell and free yourself of all negativity of spirit with the extreme, supreme joy of the victor. 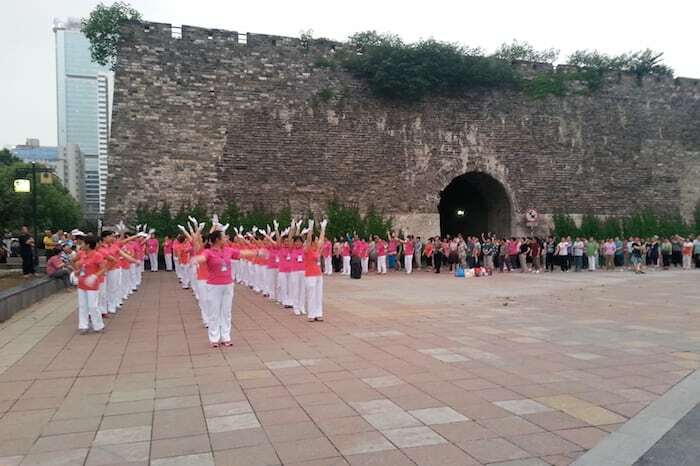 But if you prefer to listen, why not bring a little radio from home: a voice commenting on the latest national disgrace, or another that shrills out Chinese opera, or just recounts the latest part of an infinite story. At full volume, obviously, so that even others can hear. 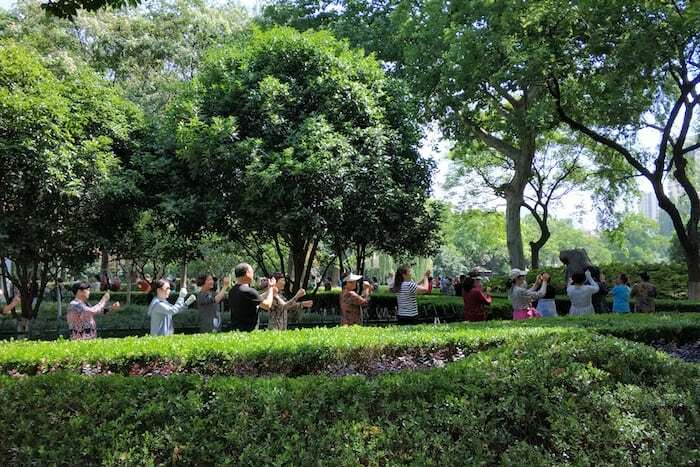 In better equipped parks or along the street; but truthfully even in well equipped condominiums: the life route is a meeting place for old friends where you can exercise the body and renew the spirit. Freely chatting and cackling while rolling the knobs, walking over nothing, they regularly shake along the platform and then end with some extreme stretching. They don’t like half efforts. I’m sure that this is the activity that I’ll wind up doing the day that I feel mentally at peace with the universe. Without a doubt it requires memory, consistency and motivation: but if you don’t have any of these characteristics, don’t be discouraged. 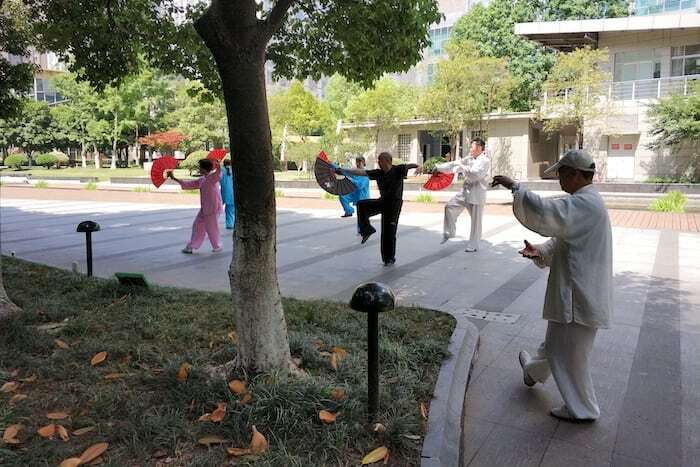 My nearby grandpa with the sporty style walker, because of his reduced mobility from the waist down, designs his elegant tai ji movementswith just his forearms. And without really moving his elbow from his side so as to not risk losing his balance. This he does every day, without fail, with snow or at 40°, from 16 to 17.30 in front of the entrance of my house. Shooting basketball with friends at any age! Thanks to the memorable NBA career of Yao Ming, now all China wants to play basketball. Why should a grandfather have less interest than his grandson? What’s the difference? The physique du rôle perhaps. By now it’s considered a somewhat out of date activity that’s lost its appeal. A few years ago it was very popular, but now it’s been surpassed by weirder things in my opinion. It’s called jianzi (毽子) or jianqiu (毽球) the type of feathered and colored birdie that’s much heavier than the one used in badminton, which must always be kept in the air. The general rule is that you can’t use your hands: so high-performance players try their hand at twirls at the level of showoff football players. 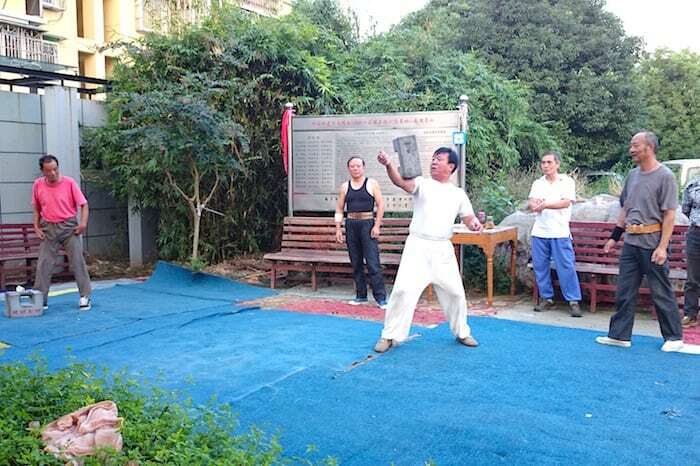 It’s a national sport in China, so there isn’t a tourist or foreigner that will not at least once find themselves involved in a match: it’s not obvious how to keep this thing in the air, especially if you’re interested in a group game and not solitary conversation with the pavement. 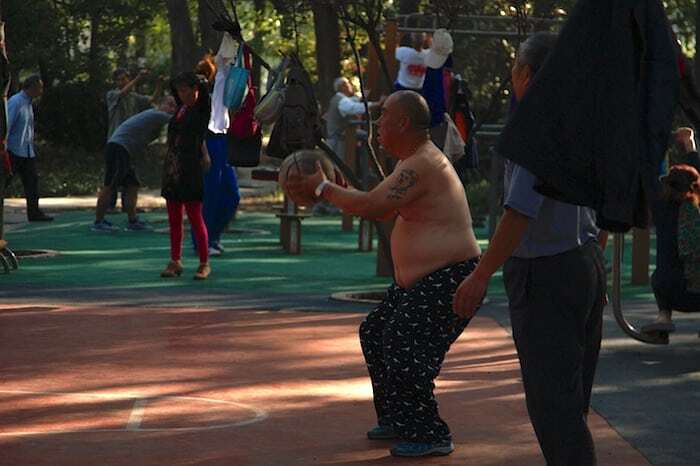 This I swear is one of the sports I discovered in China that makes me craziest. It seems a big waste of time, but is rather one of the most complex gestures to decently perform. 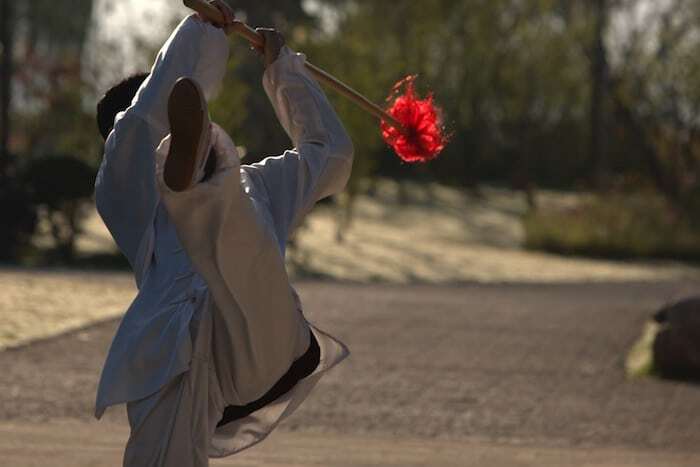 Its actual name: rouliqiu (柔力球), or something like the ball of force and flexibility. Let’s go. I also had a ten minute test lesson from the grandpa on the shift, but after having dropped the ball at least ten times in a row, I decided that I’m better at hitting one violently than keeping it in the air. Look, if you should find yourself in front of a ping pong table in the park, don’t rush. You’re in China, so think it over well: the use of this type of infrastructure is only reserved for those whose shots that break the sound barrier. 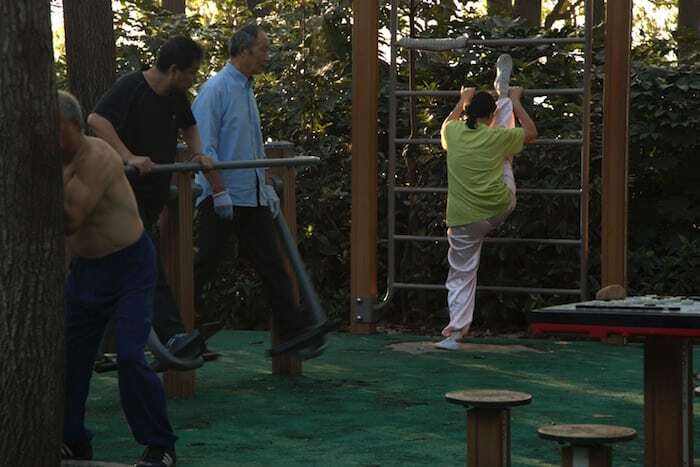 No, this is normally not a park activity. And I can recount various adventures in pools (though I think I’ll save them for another piece). However, in some places, which you will only hear about once you’ve gotten settled in your city, there are swimming areas. Or those that popular wisdom considers swimmable, though I’m not sure if the local agency of environmental protection would have the same opinion. In my neighborhood, when the heat comes, a little stubborn head goes up and down in the lake below in a time that is prohibitive for my rest: a trip there, back and off to work. Everyone has their passion. There are those who fish and those who walk their pet. 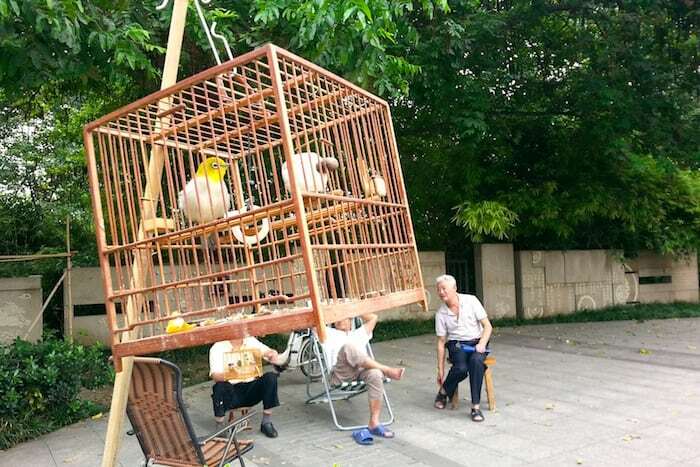 Specifically, cheerful comrades that are fans of birdsong attach their colored cages to branches and enjoy the chirping of their birds who sing during their time in the open air. Sure, it isn’t one of the most energy-consuming activities; maybe you’ll use 50 Kcal, just from the repeated use of your thumb to light cigarettes. For sure, there are also those who can’t move. Or those who after physical activity choose to rest by playing table games. 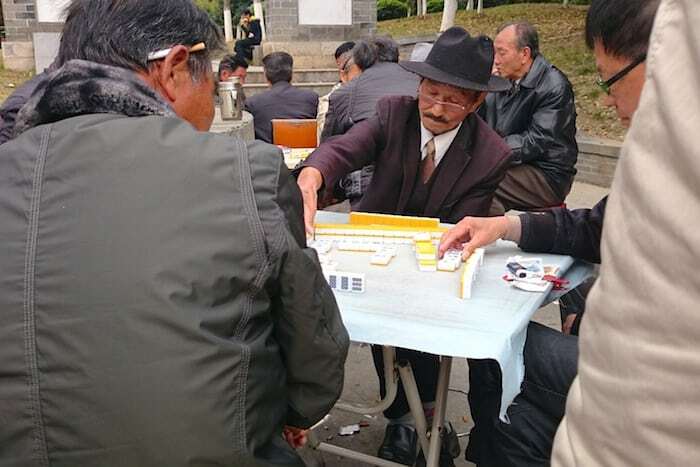 The majority go for the table game majiang (Mah Jong). Fan groups are incredibly well-organized: when X hour arrives, the square is prepared with the speed of a dealer shuffling the deck, and before you know it the couples are at their tables in a polite and silent murmuring. Only the clicking of the tiles that are replaced or discarded remain. 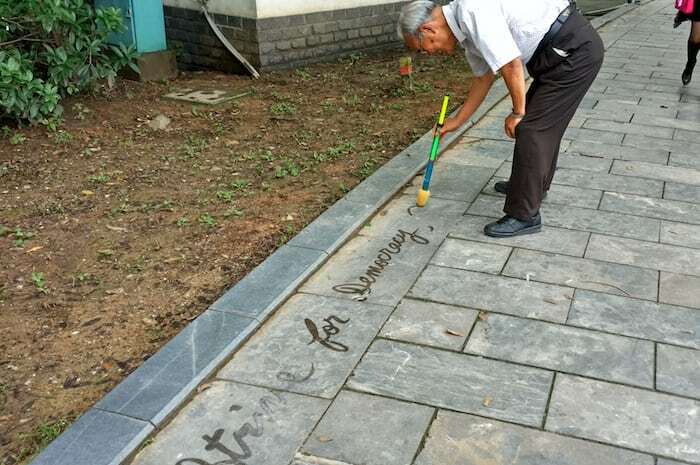 A solitary artist practicing writing with water… in English! 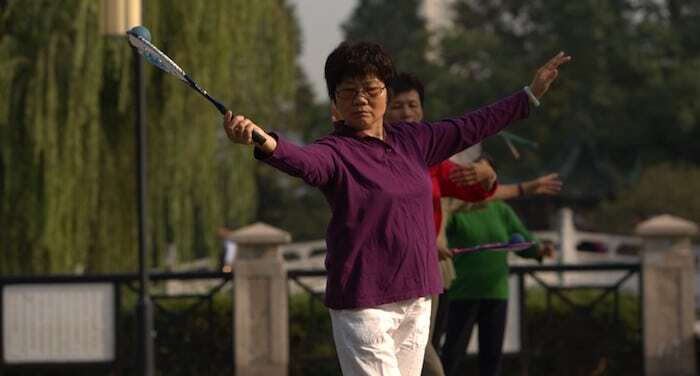 Another practice of enormous usefulness for the spirit, is performed best by the single old person at the park. What’s needed? A large pen with a soft tip, a bucket of water and an extensive knowledge of Chinese poetry or chengyu (Chinese “proverbs”). And obviously a flat piece of pavement to keep in place the letters painted with water on its surface. Maneuvering that handle delicately so that the result is beautiful calligraphy and not just a badly mopped floor is no easy task. Much more so if you write in Chinese characters. Actually, I thought it would be more interesting to attach this photo: a nice person who didn’t speak a word of English but wrote politically charged sentences while saying that they understood its meaning perfectly. Mah. Anyhow, strive for democracy. Are you convinced that it isn’t a sport? That’s because you haven’t seen the energy and seriousness that the Chinese do it with! First of all, to be clear, I’m not referring to KTV in closed rooms where there’s also a marathon of alcohol; but rather free karaoke, held in a square. It goes like this: there’s the usual grandpa that sacrifices themselves for the cause (and in reality there are two types of singers) and each evening they’ll drive their equipment to the agreed on place. When they decide to leave, they’ll have to stay because membership is by word of mouth, or from distributing ads. So when he arrives with his cart, unloads the harness and equipment system rigorously loaded the night before, he attacks the music. The kit of a good karaoke singer includes a self-powered speaker, a portable computer with a wide selection of songs with scrolling text, at least a pair of microphones for duets, and stools for singers waiting in line for their turn. High decibels: you need to reach the crowd on the other side of the street and preferably loud enough to overcome the music of dancers there on the side. China is the land of strangeness. Most of all, it’s a place where anyone who has an idea, even the most criminal idea possible, can seek to make it a reality and establish an activity with its own following. So if you get up in the morning trying to organize a test of strength between friends and peers, just lift a brick, and why not. Maybe someone else will take the challenge. Maybe it will become something serious and your right arm will be double the size of your left one. Perhaps.